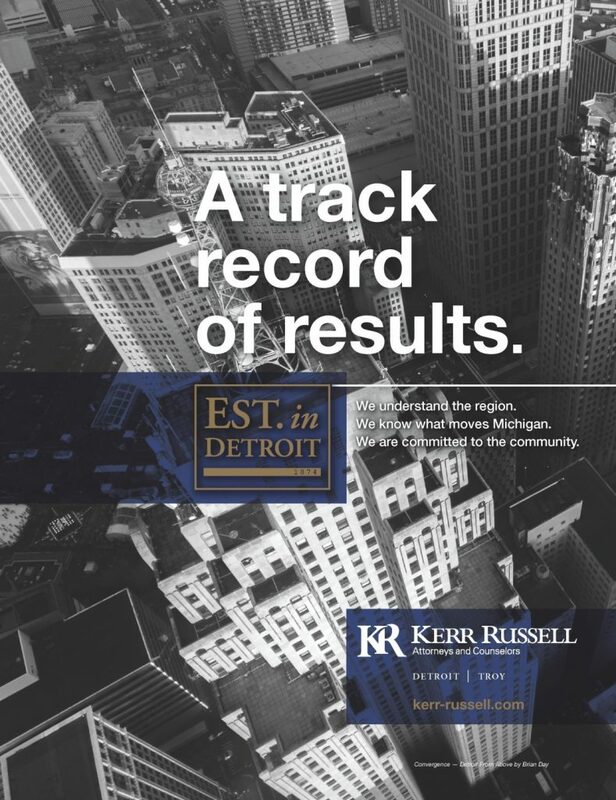 With this month’s issue of dbusiness, focused on Top Lawyers in Metro Detroit, Kerr Russell launches its new brand advertising with “A Track Record of Results.” Working with Identity Public Relations and Marketing, Kerr Russell’s marketing team developed the creative to emphasize the firm’s longstanding place in Detroit’s legal and business history. Local artist Brian Day was tapped to provide the first image featured: titled “Convergence,” the dramatic photo depicts an aerial view of downtown Detroit, including Kerr Russell’s home in the Ally/One Detroit Center (upper right). The ad will also be featured in Crain’s Detroit – Book of Lists next month.